Rendering of Entergy New Orleans’ proposed New Orleans East power station. 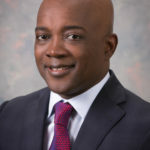 Over the last several months, Entergy New Orleans CEO Charles Rice and other officials with the utility company have been hosting public information meetings across the city and in New Orleans East, specifically, to share their plans and listen to residents’ concerns about its proposal for a new power station. 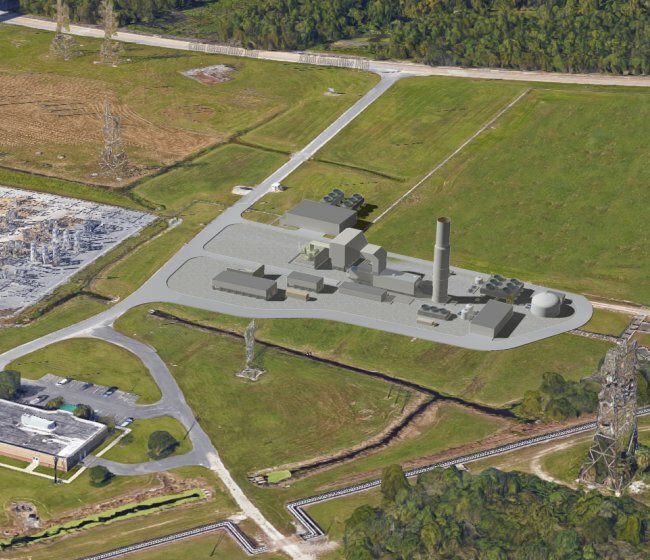 Entergy New Orleans wants to build a combustion gas turbine (CT) electric generation facility on the site of its deactivated Michoud Electric Generating Plant. The company submitted its application to the New Orleans City Council for approval last June. On June 1, Entergy New Orleans deactivated its units in Michoud. Shutting down the old station, built in the 1960s, made economic sense but resulted in a loss of 781 megawatts of local generation capacity, according to Entergy officials—leaving the utility company with a need to increase its overall capacity and local peaking and reserve capacity resources in Orleans Parish. “While the acquisition of the highly-efficient Union Power Station Unit 1 near El Dorado, Arkansas, and the purchased power agreement with Entergy Louisiana’s Ninemile 6 generating unit in Westwego helped offset a large portion of New Orleans’ need, there is still a need for capacity, including a substantial need for peaking and reserve resources,” Rice says. And that is why Entergy New Orleans wants to build a new plant on the old site. Engaging the community has been an important part of the process, says Rice. The plant is expected to cost $216 million to build, would produce 226 megawatts of power daily, and create about a 100 construction jobs and 12 permanent jobs once complete. There is also the expectation that it will help boost the East’s economy, with increased traffic that will generate sales for other area businesses, Rice says. Entergy New Orleans estimates that construction of the New Orleans Power Station will generate nearly $206 million in new business sales in Orleans Parish, more than $28 million in new household earnings for parish residents, an average of 92 jobs per year, while pumping nearly $983,000 in new sales taxes into the city of New Orleans’ revenue stream. Most importantly, the power station will help Entergy New Orleans better serve its customers, Rice says. Because the price of electricity is impacted by the capacity of power plants that produce energy, a new power station in the East will aid Entergy New Orleans in meeting the electricity demands of the utility corporation’s service area more reliably at the lowest reasonable cost, without being at the mercy of price fluctuations of the supply and demand wholesale electricity market. Still, the proposal has not been without its detractors. One coalition of environmental organizations has condemned the proposal because of risks to the environment, citing air pollution, land subsidence caused by pumping groundwater that might lead to increased flood risks as well as adding to climate change concerns. Critics of the proposal also lament the proximity of the planned station to minority communities. New Orleans East is largely comprised of African-American and Vietnamese residents. It is a concern that Rice does not take lightly, adding that Entergy weighed other options before determining that Michoud was the best site. The plant is expected to run a little less than two months out of the year, but the Midcontinent Independent System Operator (MISO) could dispatch the unit more frequently to ensure local reliability in the region. MISO is one of the largest regional transmission organizations that manages the flow of power on the grid and operates markets for the purchase and sale of electricity. The decisions on when the power station runs and for how long will made by MISO. Rice also says that construction at the Michoud site was the lowest cost option for a new power station—an important factor for those concerned about the cost of the station being passed on to customers. Regarding environmental concerns, Rice says Entergy’s remains committed to looking for “cleaner and more efficient ways of generating energy.” He adds that independent examination of the environmental impact of the proposed plant has indicated that the plant will have minimal adverse impact on the environment. Entergy New Orleans has published the independent technical report on the proposed plant’s impact on groundwater withdrawal and air quality at the site. The study, available on Entergy New Orleans’ website, was conducted by Baton Rouge-based CK Associates. According to that environmental impact study, the proposed pumping at NOPS will have limited influence on groundwater elevations across the region and at the Michoud plant and will not cause structural damage. 3.) The emissions from the proposed NOPS will result from combustion of clean burning natural gas; in no case, will the emissions cause air quality to exceed regulatory standards, which are protective of human health and the environment. In fact, as it relates to emissions, the report asserts that there will be no new chemicals released at the power station compared to the historical operations of the Michoud plant and that the new plant will represent a significant reduction in emissions compared to emissions when the Michoud plant operated before its closure last summer. Entergy New Orleans’ is just one of the Entergy Corporation subsidiaries requesting to build a new power plant or purchasing existing facilities as a part of a larger plan to strengthen the utility giant’s power generation and transmission capacity and presence across southern U.S. The Louisiana Public Service Commission in November gave Entergy Louisiana approval to build a new $869 million power plant in Montz (St. Charles Parish). That plant is expected to be operational by 2019. The St. Charles Power Station will generate up to 980 megawatts of electricity and is expected to employ 27 permanent workers and up to 700 workers during construction. And last October, Entergy Texas filed an application with the Texas Public Utility Commission for permission to build the plant a nearly $1 billion, natural gas-fired power plant north of Conroe in Montgomery County (just north of Houston, Harris County) to help power Montgomery County and beyond. The proposed Montgomery County Power Station would help serve Entergy’s 434,000 customers in 27 southeastern Texas counties to the north and east of Houston. The proposed, 993-megawatt power plant would cost an estimated $937.3 million and go into service in 2021 after beginning construction in early 2019. Also, earlier this year Entergy Corporation purchased a 1,980-megawatt natural gas-fired combined-cycle power plant in Arkansas for $948 million. The Union Power Station consists of four combined-cycle gas turbines that generate 495 megawatts. Entergy Arkansas and Entergy New Orleans each acquired one unit, and Entergy Louisiana acquired two. Four years ago, in late 2012, Entergy Mississippi purchased of the Hinds Energy Facility, a modern, 450-megawatt natural gas-fired power plant located in Jackson for $206 million.